The U.S.S. Cooperstown will be a sister ship to the U.S.S. Freedom, pictured here. Bob Feller signed up to fight in World War II on Dec. 9, 1941, as ships and airplanes lay in wreckage at Pearl Harbor and after more than 2,400 U.S. service men had died. Feller, already a great pitcher for the Cleveland Indians and a future Hall of Famer, missed three full seasons (1942-45) and part of another (1946) while aboard the U.S.S. Alabama battleship, seeing combat action in the Philippines Sea and elsewhere. Navy Secretary Ray Mabus saluted Feller, as well as the many other Major League players who served in World War II, during a recent ceremony held at the Baseball Hall of Fame in Cooperstown, N.Y. Mabus also announced that the Navy’s next ship will be christened the U.S.S. Cooperstown. 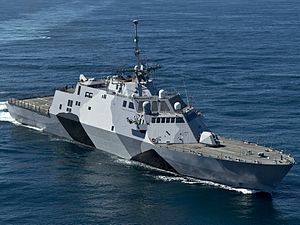 The Cooperstown will be a Freedom-class littoral combat ship, designed to go close to shore (the littoral zone) and drop off an assault force if needed. A bit smaller than a guided-missile frigate, the Cooperstown will feature a flight deck and hanger for two Seahawk helicopters. Navy officials plan to use the Cooperstown in several roles, including anti-submarine warfare, reconnaissance, intelligence, logistics and more. Lockheed-Martin will build the 388-foot ship in Wisconsin. The littoral combat ship is a new type of Navy ship, Mabus said. “These ships will serve our nation for decades,” he said at the ceremony. Mabus said that 36 future Hall of Famers served in World War II and 64 served in combat altogether, from the Civil War to the Korean War. Commissioned Nov. 7, 1931, the U.S.S. Indianapolis earned 10 battle stars before being sunk by Japanese torpedoes on July 30, 1945. The best scene in the 1975 blockbuster movie Jaws takes place in the disheveled cabin of a rickety fishing boat. Three men (Quint, Hooper and Brody), as much drunk as sober, discuss broken hearts, lop-sided arm wrestling contests and, finally, a long-ago piece of war history that began to unravel in tragedy shortly after midnight on July 30, 1945. Brody points to a scar on Quint’s arm. Old tattoo, Quint grumbles. Hooper makes a joke. “Don’t tell me. Don’t tell me. ‘Mother.’” he says with an unfortunate giggle. Hooper, a marine biologist, turns sober at the mere mention of the Indianapolis. Brody, a police chief, remains clueless. Now, Jaws, as you probably know, is quite the fish tale. It seems that a large great white shark in Amityville (on Long Island) has chosen to turn local bathers into snacks. This being bad for tourist business, Messrs., Quint (Robert Shaw), Hooper (Richard Dreyfuss) and Brody (Roy Scheider) head out to sea in hopes of catching the ornery shark. The U.S.S. Indianapolis, a Portland-class heavy cruiser, left San Francisco harbor on July 16, 1945, carrying enriched uranium and other parts for the atomic bomb Little Boy. The ship delivered its cargo to the U.S. Navy airbase at Tinian island on July 26 and left for Guam to pick up some sailors. The Indianapolis departed from Guam, heading for Leyte, on July 28. A Japanese submarine, the 1-58, hit the Indianapolis with two torpedoes. The first one crushed the ship’s bow. The second one hit near midship next to a fuel tank and a powder magazine. It was 14 minutes past midnight, midway between Guam and Leyte Gulf in the Pacific When the Japanese torpedoes hit, 1,196 men were aboard the ship. Approximately 900 made it into the water. The shark attacks began at sunrise on the first day. “You know,” Quint says, “the thing about a shark is that he’s got lifeless eyes, black eyes like a doll’s eyes … ‘til he bites you.” Quint figures that 1,000 sharks, “maybe more”, circled the bloody scene. Over the next few days, the sailors also suffered from exposure, dehydration and saltwater poisoning. 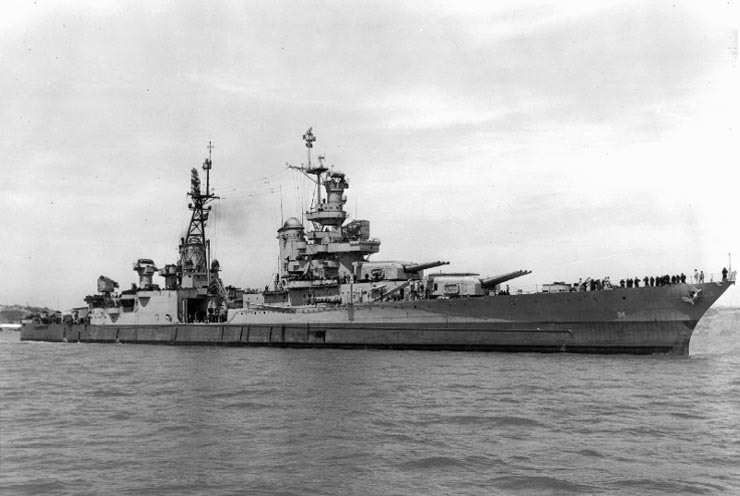 No one reported the Indianapolis missing even after it did not arrive as scheduled at Leyte on July 31. At 11 a.m. on the fourth day, a Lockheed PV-1 bomber on routine antisubmarine patrol spotted the survivors. Lt. (j.g.) Wilbur C. Gwinn, the PV-1 pilot, radioed his base on the island of Peleliu. “Many men in the water.” Navy commanders sent a PBY seaplane, piloted by Lt. R. Adrian Marks, to help. Marks overflew the destroyer U.S.S. Cecil Doyle and reported the emergency. The Cecil Doyle captain diverted to the rescue scene. Marks, against orders, landed on the sea. He and his crew pulled in 56 sailors. The Cecil Doyle arrived in total darkness and began taking aboard survivors. “That’s when I was most frightened,” Quint says, “waiting for my turn.” Of the approximately 900 who made it into the water on July 30, 317 were finally rescued. The investigation was fraught with controversy. No Navy directive had ordered McVay to zigzag, for instance, and a decorated U.S. submarine commander testified that given the identical circumstances facing the Japanese submarine on July 30, he could have sunk the Indianapolis whether it had been zigzagging or not. Fleet Admiral Chester W. Nimitz later remitted Capt. McVay’s sentence and restored the officer to active duty. Even so, many families wrote angry letters to McVay over the years, blaming him for “killing my son.” In a tragic end to a tragic episode, McVay committed suicide on Nov. 6, 1968, at the age of 70. When family found him, he was holding a metal toy sailor in one hand. “Nemo” Gaines graduated from the U.S. 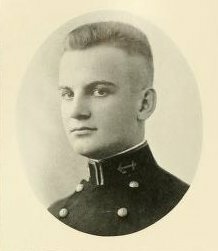 Naval Academy in 1921. Lt. j.g. Roland “Nemo” Gaines hurled a praise-worthy scoreless inning on June 26, 1921. Gaines had recently graduated from the U.S. Naval Academy in Annapolis, Md. The Navy granted him temporary leave in order to play ball. Signed by the Washington Senators, Gaines made his debut against the New York Yankees. The Navy, though, quickly called Gaines back to duty. Gaines’ career in the majors lasted just four games and 4.2 innings. He gave up five hits, two walks and struck out one batter. Nemo retired with an ERA of 0.00. A native of nearby Alexandria, Va., Gaines returned to ship life. He served as a naval attaché in Peru during World War II and left the military in 1946. Later, he, along with his brother, Leland, opened a hardware story in Alexandria. He also raised Hereford cattle in Virginia, even serving for a while as director of the state’s Hereford Association. Gaines died of cancer on Jan. 26, 1979, leaving behind a wife, two children and six grandchildren. He was 81 years old and the Naval Academy’s sole representative in Major League history until this season. Now, three former Midshipmen have played ball in the big leagues. Mitch Harris, a 2008 Academy graduate, made his debut with the St. Louis Cardinals on April 25 against the Milwaukee Brewers. The right-hander struck out the first batter he faced (Adam Lind) and threw 1.1 scoreless innings. Harris, 29, majored in engineering at Annapolis and made third-team All-American as a senior. He began pitching in the Cardinals’ minor league system after completing a four-year service commitment. During his Navy career, Harris visited 30 countries and was deployed at one point in the Persian Gulf aboard a 577-foot amphibious troop deck, the U.S.S. Ponce. So far this season, Harris has appeared in relief 16 times. He has a 1-1 won-loss record in 17.1 innings of work with nine strikeouts. Oliver Drake, who spent two years at the Academy before leaving to play pro ball, debuted May 23 for the Baltimore Orioles. Like Gaines and Harris, Drake is a pitcher and held the opposing team scoreless in his first game. Drake, 28, threw three innings against the Miami Marlins, struck out two batters and gave up two hits. The right-hander pitched in five games and 7.2 innings with a 3.52 ERA before being sent down to the AAA Norfolk Tides on June 3.